In 2018, as the Syrian conflict entered its 8th year, the scale and severity of humanitarian needs across the country remained overwhelming. The situation has been particularly dire for the civilian population, who have often borne the bulk of the brunt – by September 2017, an estimated 13.1 million people in Syria were in need of humanitarian assistance. Continuous violations of International Humanitarian Law (IHL) have been widespread and conflict is still the principal driver of humanitarian needs. Protracted crises such as this require interventions that go beyond humanitarian emergency responses. To help narrow the gap between prevalent health needs and available health services, the Danish Red Cross designed a 3-year project providing a resilience-based approach to the specific health care requirements of the population, with a special focus on long-term disabilities. Access to primary health care through an Essential Package of Primary Health Services to cover the needs of vulnerable populations. Access to secondary health care, including trauma care. Maintenance of the supply chains of medicines for the treatment of trauma, obstetric care, infectious diseases, and chronic conditions. Maintenance and upgrade of epidemiological surveillance and capacity to detect, investigate, communicate and contain threats to public health security with early warning systems to minimise the impact of epidemics related to unsafe water, poor sanitation and hygiene, overcrowding, low vaccination coverage and other related factors. Access to reproductive health services and child health care. There is also a dire need to increase availability of mental health services. 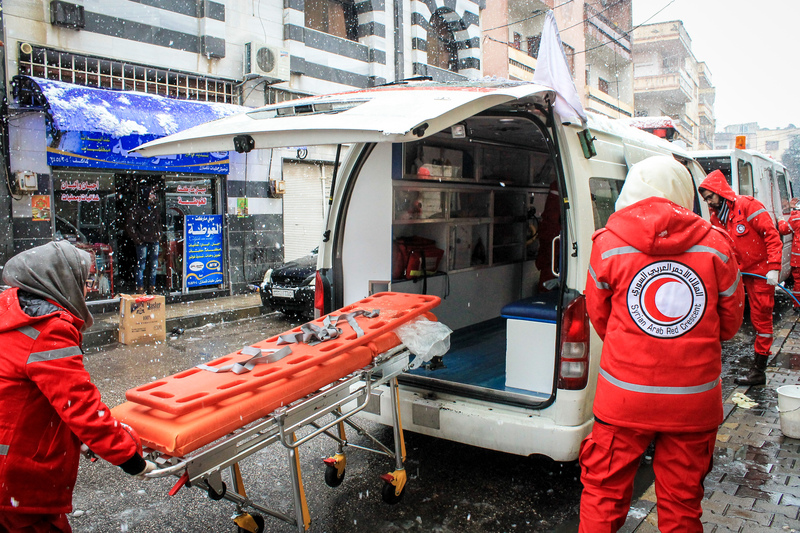 The project aims to establish functional and operational links between ongoing emergency and non-emergency programmes across Syria, achieving maximum complementarity among all running projects. The project’s consortium consists of four partners: the German Red Cross, Finnish Red Cross, SARC and the project lead, the Danish Red Cross. Additionally, all activities are implemented in continuous collaboration with the International Committee of the Red Cross (ICRC). In the short-term, the main outcome of the project is to increase access to non-emergency healthcare for particularly vulnerable groups in Syria, such as populations in hard to reach and non-government-controlled areas, people with physical traumas, and people with long-term disabilities. The key outputs are reconstructing and rehabilitating SARC’s health facilities to address long-term healthcare needs, increasing SARC’s capacities to provide accessible secondary health services to vulnerable populations, and providing people with long-term disabilities and special needs with access to physical rehabilitation and psychosocial care. The project has been funded by the European Commission Directorate-General for Neighbourhood and Enlargement Negotiations (DG NEAR). Launched in January 2018, it will be implemented for 3 years and has a budget of EUR 6 million.